In a previous article, I talked at length about the Sealskinz’ new Super Light Pro Sock. 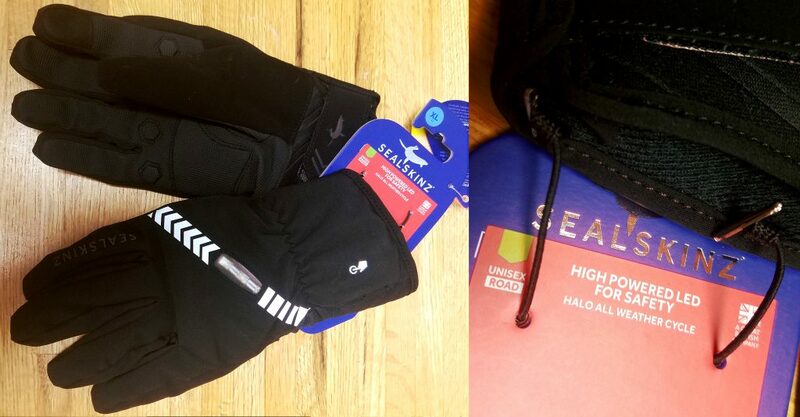 While Sealskinz as a company began with socks, they have evolved their product line to include headwear and gloves for winter rides. One of the products that piqued my interest was the Halo glove. It drew my attention because it is a waterproof, winter glove with an active blinker system built in. Read on to see what makes these gloves interesting and some of my initial thoughts. Even though Sealskinz made a name for themselves with socks, they didn’t allow themselves to get caught on their heels (HEELS! Get it!). Sealskinz is committed to keeping all your extremities warm and dry. That mission is the inspiration behind the Sealskinz gloves we will be reviewing for winter rides. 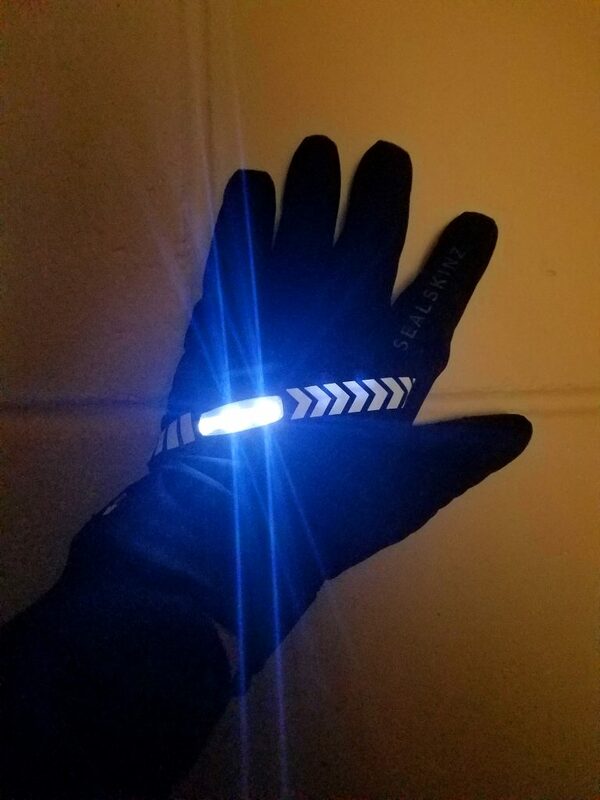 My first review will be on the Halo glove, a unique waterproof glove with powerful LED lights built into the back of the hand. Waterproof doesn’t stop at the product for Sealskinz. Even the packaging that holds your glove is considered. Rather than punching holes in the glove to mount it to a backer card like most brands, Sealskinz sews loops into the glove to ensure it never gets damaged. The Halo bike glove is an $80 investment full of many features. 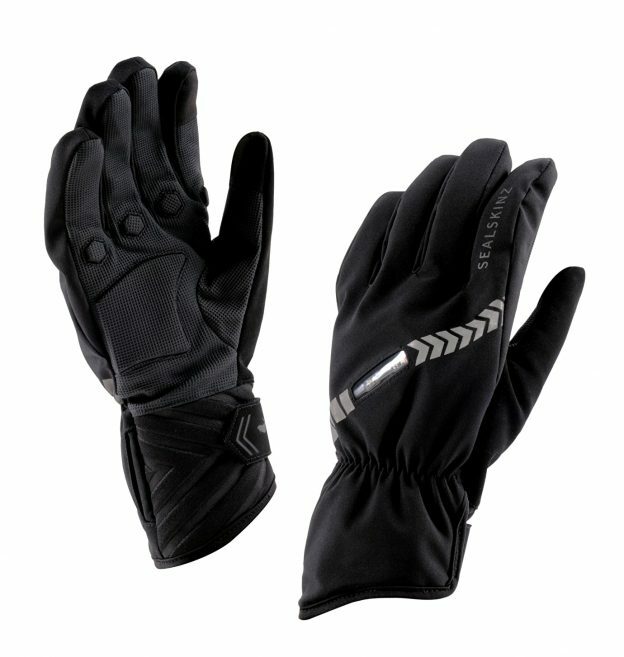 It is constructed with a synthetic suede palm, incorporating gel pads for greater comfort on winter rides. The outer shell is completely waterproof, and the glove is machine washable. Additionally, the liner uses an anti-slip material that won’t pull out of the glove when you remove them. Finally, the cuff closes with soft Velcro straps that are large enough to be manipulated with a gloved hand. One thing that is unique to cycling gloves is the way they insulate. Most cycling gloves are windproof, waterproof, and have minimal insulation. I can hear you asking already “minimal insulation?”, yes minimal. Cycling gloves rely on you to generate heat by exercising on winter rides. Under those circumstances, the glove holds the heat you create, keeping you warm. By being water/windproof and relatively thin, cycling gloves offer better dexterity than a normal winter glove. Immediately upon putting the gloves on, I was impressed. The liner is soft and warm to the touch, and the glove fit was great. All the fingers articulate well without any pulling of material folding uncomfortably. Additionally, the lights activate easily and are really bright. The first time I rode with the Halo bike glove the temperature was just below freezing and rainy. Luckly, it wasn’t a real downpour and more of just a misting, but it was wet none the less. My forty minute commute ended with all my fingers being warm and toasty. Since that day I have ridden down to about 20 degrees and the gloves never left me wanting in the warmth department. My commuter bike has a flat handlebar, so when the Halo’s lights are activated, they shine forward giving me more visibility to oncoming traffic. In the case of a drop handlebar, the Halo glove will shine to your sides. The Halo’s lights are really bright, and really lightweight. I hope to push these gloves as far into the cold as I can handle. Once I reach the Halo’s limits, I get to switch to Sealskinz Highland Claw Glove for the colder temps. Overall, I am really excited to see what the life of the lights on the Halo glove is and if they can survive the cold and moisture of Minnesota’s winter. Stay tuned for more info. This entry was posted in News and tagged bike blinkers, bike gloves, Bike lights, biking gloves, commuter gloves, cycling gloves, cycling visibility, gloves, Halo Bike Gloves, HaveFunBiking, mountain bike gloves, mountainbke gloves, road bike gloves, sealskinz, sealskinz gloves, visibility, waterproof gloves on November 8, 2017 by John Brown.